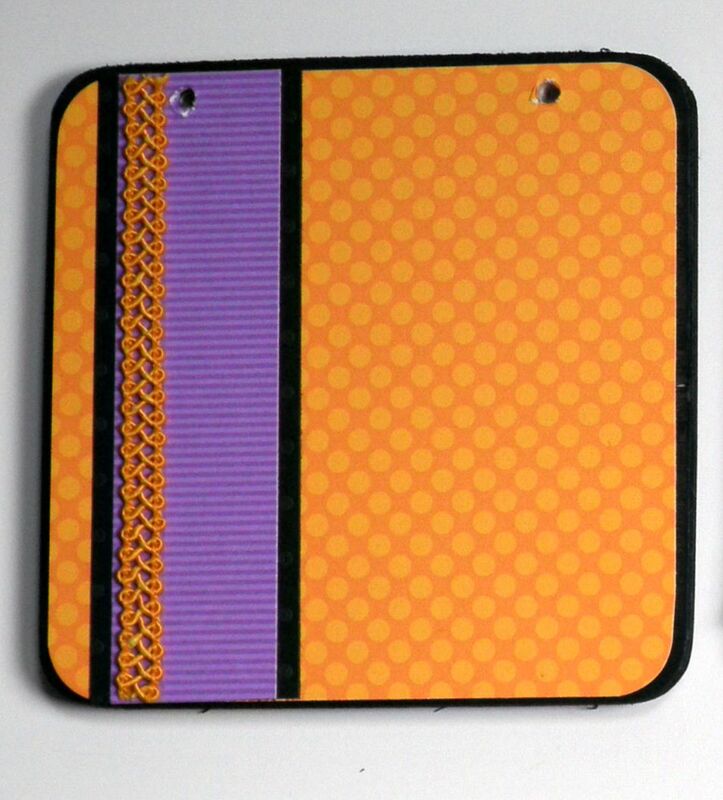 Base: 9" by 4&1/2" orange swiss dot cardstock. 4" by 4&1/2" black swiss dot cardstock. Glue down with Scrap Happy Glue. 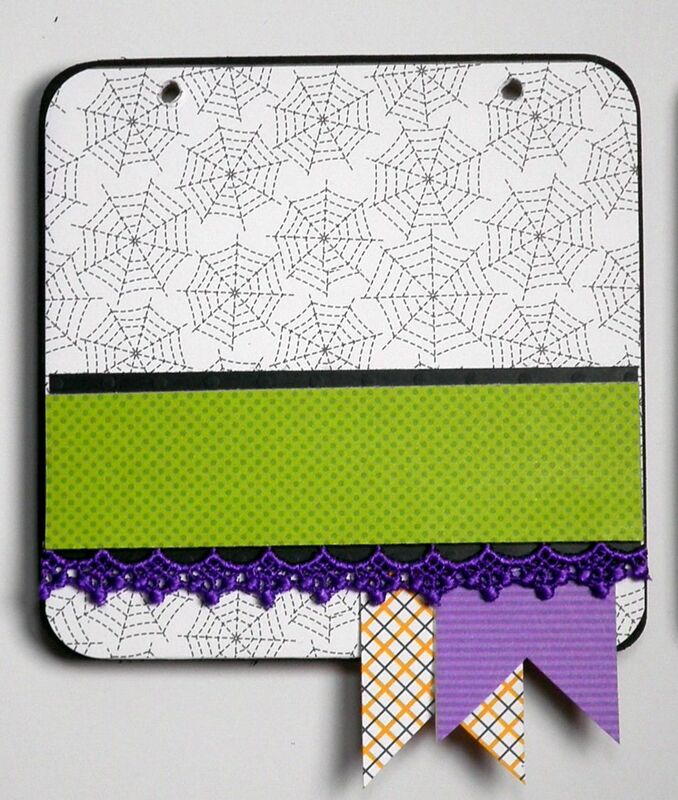 Create strip with 3/4" piece of spider web patterned paper, matted on 1" piece of black cardstock, matted on 1&1/4" piece of purple cardstock. Glue over seam between black and orange cardstock. Stamp skeletons on a 7&7/8" by 2&3/4" piece of white cardstock. Color with markers and brush edges with Black Soot Distress Ink. Glue to center of plaque. 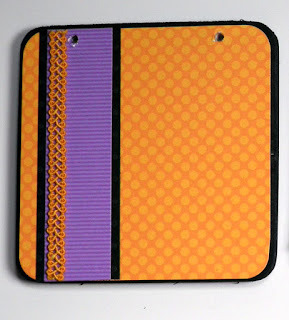 Punch circles out of green patterned paper (1&1/4") and purple patterned paper (1"). Stamp sentiments on white cardstock, trim to banners, and brush with Black Soot ink. Glue down circles and then add sentiments with foam tape. 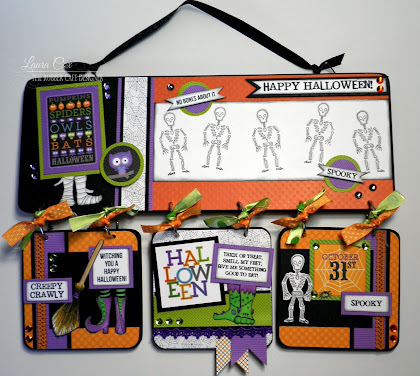 Stamp Happy Halloween sentiment in Black Tuxedo ink trim to banner and mat on black cardstock. Add to plaque with foam tape. Add rhinestones. For left side of top, stamp mummy feet, color with markers, fussy cut out, attach with glue and foam tape, add "pumpkins/spiders/owls/bats/halloween" piece cut from patterned paper, matted on green patterned paper, then foam taped over mummy feet. Add owl punched out with 1&1/4" circle punch and matted on 1&1/2" green circle. Add rhinestones. First square (on left): Orange dot paper is base (3&7/8" square with corners rounded). Mat a 1" piece of purple stripe paper on a 1&1/4" piece of black cardstock. Glue to left side and add orange ribbon. Next, add a 2&1/2" by 3" piece of black cardstock to the right side. Stamp sentiments, broom and shoes on white cardstock. Color broom and shoes, fussy cut out. Trim down sentiments, brush edges with black soot ink, mat on purple stripe paper. 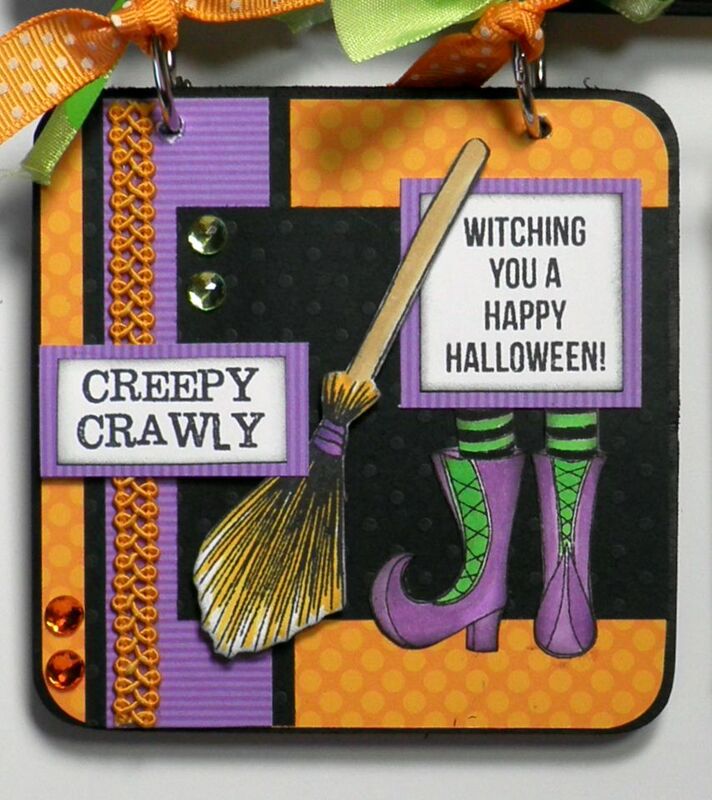 Glue sentiment and shoes on the right side, add broom and creepy crawly sentiment with foam tape. Add rhinestones to finish. 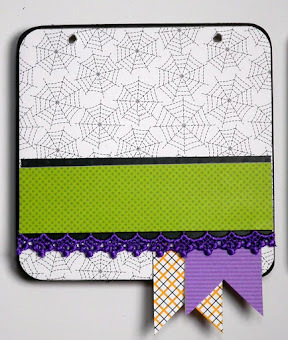 Middle square: Spider web paper is base (3&7/8" with corners rounded). 1" strip of green patterned paper matted on 1&1/4" piece of black cardstock...add purple ribbon under bottom edge of green as glued down. 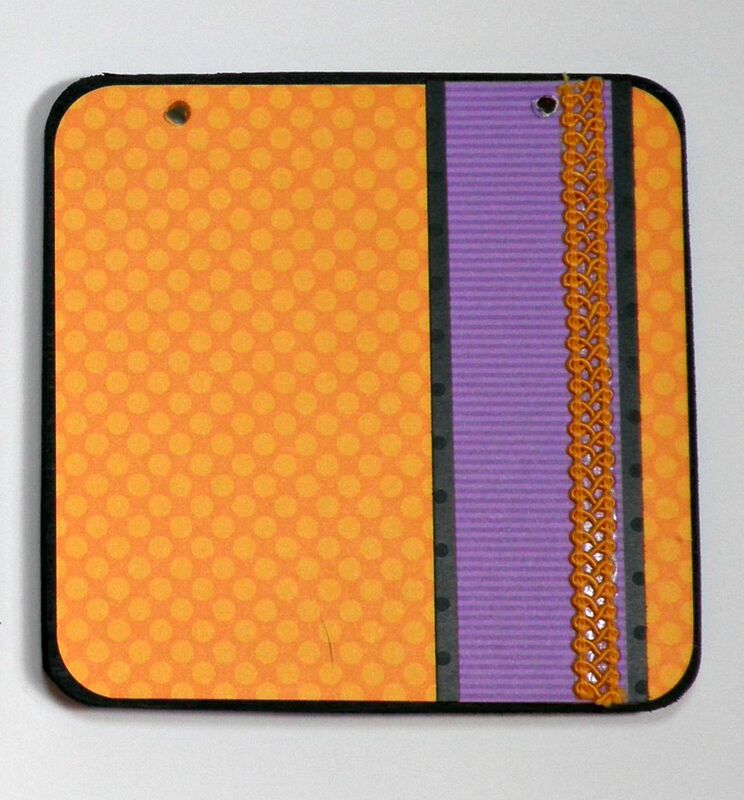 Add banners (1" strips of purple stripe and black and orange grid) under this strip as you glue it down. 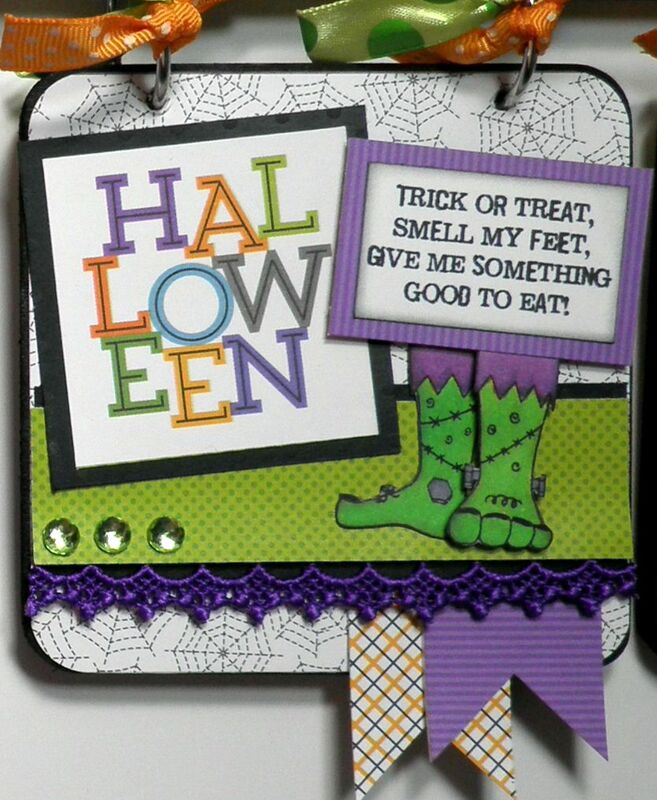 Stamp sentiment and monster feet on white cardstock with Black Tuxedo ink. Color feet and cut out. Trim sentiment, brush with ink, and mat on purple stripe paper. 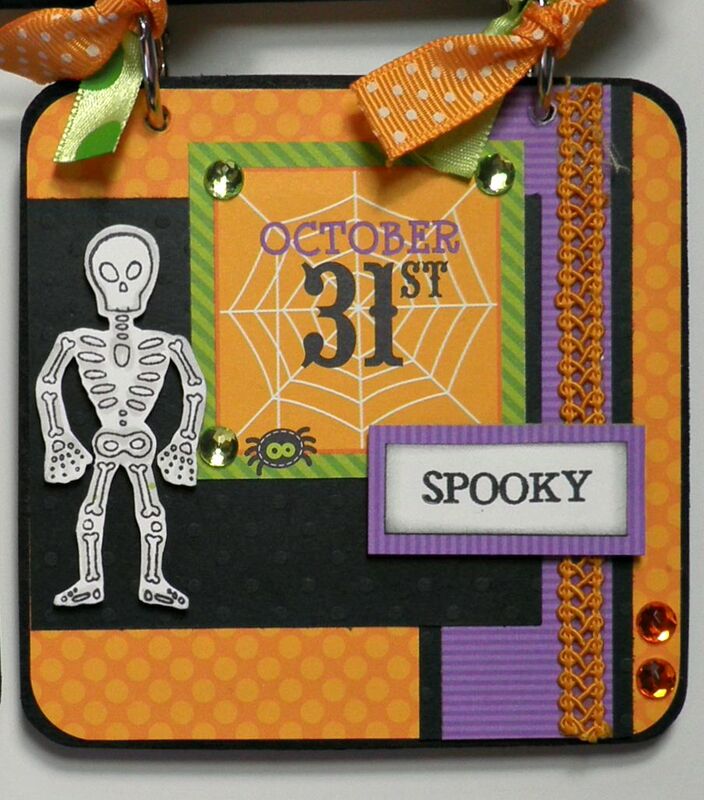 Cut out Halloween from patterned paper and mat on black cardstock, glue to left side. Use foam tape to add sentiment and monster feet. Add rhinestones to finish. Last square (on right): Orange dot paper is base (3&7/8" square with corners rounded). Mat a 1" piece of purple stripe paper on a 1&1/4" piece of black cardstock. Glue to right side and add orange ribbon. Next, add a 2&1/2" by 3" piece of black cardstock to the left side. Stamp skeleton and sentiment on white cardstock. Color and cut out skeleton, trim sentiment down, brush with ink and mat on purple stripe paper. Cut out October 31st from patterned paper and glue down. Add skeleton and sentiment with foam tape. Add rhinestones. Finish with ribbons tied on rings and for hanger. Thanks for stoppin' by today....hope you are inspired to create some home decor for the Halloween holiday!! Love this project! What are you using for the base of each 'tile'? It looks to be thicker than paper. Thanks!